Hundreds of attorneys and judges were reminded last week as they gathered for the MBA's Annual Conference 2004 of the important principles that first called them to the practice of law. Under the theme "Leading through Law," lawyers and judges from across the state attended a variety of informative programs and listened to several compelling speakers deliver poignant messages on issues ranging from the protection of civil liberties to corporate ethics to envisioning the future of the practice of law. Gala Dinner keynote speaker Marian Wright Edelman, founder and president of the Children's Defense Fund, call on lawyers to use their power and collective voice to improve conditions for children. 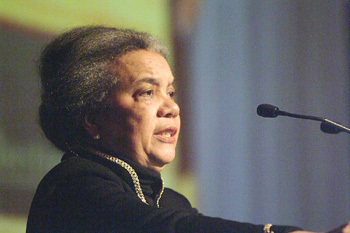 Marian Wright Edelman called on lawyers to use their power individually and as a collective voice to change the dire circumstances children face each day in the nation and in the commonwealth. The MBA House of Delegates has voted to authorize a legal challenge to the state's new "anniversary fee" policy by filing an action in Superior Court on behalf of a number of plaintiffs against the Clerk of Courts. The decision to pursue direct legal action was made by a unanimous vote following a recommendation from an MBA task force appointed in November by MBA President Richard C. Van Nostrand. The HOD meeting took place on Jan. 22 at the start of Annual Conference 2004.